We provide the information below which may help an enquirer to establish whether the holiday cottages would be suitable. A larger print version of this statement is available if required – Telephone 01200 441455. We will be happy to discuss any aspect if the cottages and their suitability for your holiday and describe the cottages and their features over the telephone. Inside each cottage we maintain a visitor guide about the area as well as important information including contact numbers for public transport, taxis, emergency services, hospitals, etc. Assistance in settling in is available if required. It is normal procedure for us to show our guests the facilities. We welcome pets into Pendleside. Kitchen/ dining area with gas cooker, microwave, fridge with freezer compartment, kettle and toaster. 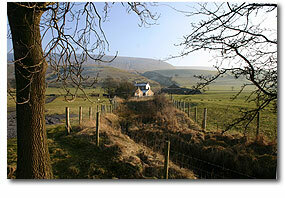 Both cottages provide stunning views across open countryside. Each has a private patio with seating area and a large shared garden area with views over the surrounding farmland. The car parking area for the cottages is approached via gated access from our farmland. You may park directly outside each cottage. The car park is level and covered with stone chippings. The car park is lit from dust until dawn. There is one step into each cottage, front door opens inwards into a tiled hallway. No steps within property. All windows require a handle and a key to be turned to unlock them. Windows need to be pushed outwards to open. Ceiling mounted pull switch to the left upon entering bathroom. Grab rail provided for toilet/ bath. The shower is contained within the bath, non slip bath mat is provided. Fitted pine wardrobes with hanging space and shelving. Main ceiling light and reading lamps provided. A good deal of natural light proved plus ceiling lights standard lamp and reading lamp. Remote control for TV and DVD player. The wood burner has a twist handle to open the door and air vents that need to be turned to control air flow and regulate temperature. Sliding patio doors with small step down onto patio area. The patio for each cottage can be reached via the patio doors from the lounge or around the outside path surrounding each property. The path around the property is level and covered with stone chippings. Each patio is flagged then laid to grass. The garden area can be approached either by a small gate leading from the car park area with a small step down, or from a farm gate leading from our access road. The garden is laid to lawn and completely enclosed by fencing. The garden is on a slight incline. A wooden picnic table and parasol is provided. There is a stream running through the garden. Each cottage is gated and fenced. We have welcomed many dogs without a problem but determined dogs may escape. Please remember we are a working sheep farm. High chairs and travel cots can be provided upon request. Dustbins are provided in the car park area; if you wish to use our recycling bins by the cattle grid please do so. Both cottages operate a no smoking policy. Smoke alarms are the audible type.